Fashion designer and entrepreneur Juhi Jagiasi will present her inaugural collection for her WOW label at the next Couture Fashion Week in New York. 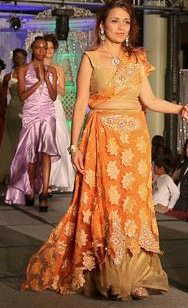 Part of the “Jewel of India” collective fashion show, the event will take place at 4:00 p.m. on Sunday September 16, 2012 in the dramatic setting of the Waldorf-Astoria's Grand Ballroom. A native of India, Juhi Jagiasi has long been inspired by the beauty, glamour and fashion of Bollywood films. She is a licensed physician as well as an enterprising choreographer and entrepreneur. Soon after moving to the USA in 1993, Ms. Jagiasi founded Jewel of India, and has since hosted many fashion events and pageants including the Miss India International pageant. She was named Mrs. Delaware International 2010. After seeing many pageant contestants struggling to find elegant, beautiful and affordable evening wear, Ms. Jagiasi was inspired to create her own fashion line. Her WOW ("Women of the World") designs have wide appeal to many women looking for the perfect special occasion ensemble. Her designs offer mix-and-match versatility providing numerous options for the wearer, from simple outfits to exotic bridal creations. "I am not looking to revolutionize fashion," says the designer, "but rather to create styles that are used and enjoyed and that bring confidence to today's women." Couture Fashion Week is a multi-day event showcasing couture and luxury fashion. It also includes exhibits of luxury brands and fine art as well as world-class entertainment and receptions. The event is held at the Waldorf-Astoria in New York City and is attended by upscale consumers, invited VIPs, the press and high-end store buyers. Couture Fashion Week offers unique promotional opportunities for luxury products and services.